Dr Matthew Todd. Photo courtesy of University of Sydney. In open source drug discovery all data and ideas are freely and immediately shared, and anyone may participate at any level. Dr Mat Todd, from the University of Sydney’s School of Chemistry, recently led a meeting titled Open Source Drug Discovery for Malaria, to discuss the application of the open source model to discovering drugs to treat malaria. “The open nature of the work means there are no patents and that any technology is both academically and commercially exploitable by whoever wishes to do so,” said Dr Todd. Drug research on malaria using scientists around the world who share data in real time, unencumbered by patents, is Dr Todd’s ambition. While no drug has so far been discovered using open source, Dr Todd led a project that used the open source approach to create a new way to produce medicine now used worldwide for the treatment of Bilharzia, a terrible parasitic disease that afflicts millions of the world’s poorest people. 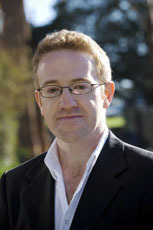 His innovation won Dr Todd the Emerging Research category of the NSW Science and Engineering Awards in 2011. Research and development of new drugs is normally done in a closed way by pharmaceutical companies, who fund the research in order to own the resultant medicines. “This makes business sense, as there are huge profits to be made from new pharmaceuticals,” said Dr Todd. “However, there are a number of diseases that simply do not interest pharmaceutical companies, because there’s little money to be made from these drugs. These diseases are normally ones affecting developing nations, such as malaria,” explained Dr Todd. Taking his open source approach to finding a new drug for malaria, Dr Todd predicts that it will have the greatest benefits in the early phases – from the discovery of biologically active compounds, to improving these compounds through chemical synthesis and biological evaluation. “I can also see the open source approach being really effective in the process chemistry phase, where we create an efficient chemical synthesis of the new drug on a large scale,” explained Dr Todd. “I see the discussion as part of a wider series of discussions about how we’re doing science, and research more generally, in a very different way… not just about the malaria problem itself and how to tackle it, but also some of the problems that come up as we move to new science methods, and open innovation and open science,” said Professor Mary O’Kane, Chief Scientist and Engineer of NSW, who opened the meeting.